Today I'd like to show you the progress I've made on my current embroidery project. 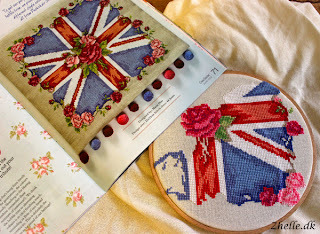 The project is called Flying the flag from CrossStitcher issue 253, and it is designed by Maria Diaz. When I first saw the embroidery, I knew immediately that it was a project for me. The magazine is from June 2012, so that shows a bit how slow I am at cross stitching! This is what I have finished so far. It is a lot smaller than I thought it would be, when I started on it. For some reason it looks big to me in the picture in the magazine. 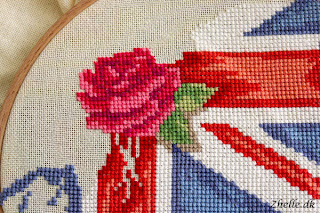 I love the rose that is going to be in the middle of the Union Jack. 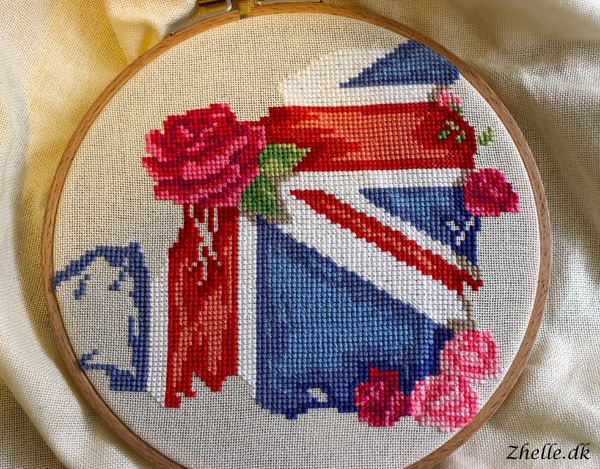 It is so pretty and delicate somehow, and I really enjoy stitching the little roses! They do make you think of what order to embroider the colours in, so it will be somewhat easy to do. It is the first time I am embroidering on linen and it is a bit more delicate and time consuming than aida. I am happy to try it though, and it is not the last time I am going to embroider on linen! As you can see there is still some way to go until I have a finished project. 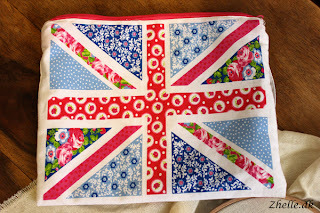 I am going to make it into a pillow instead of a hanging piece, and have it in my sofa. It is going to be so pretty and add a splash of beautiful colours to my living room! 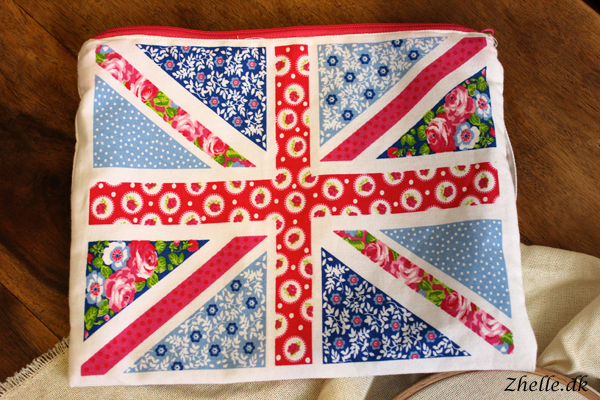 To keep it safe when I am not working on it, I bought a pretty and suitable project bag in Primark in London last summer. It fits so well, it is like it was made for it! The embroidery hoop I use fits perfectly in it, so I can keep all my embroidery items together. 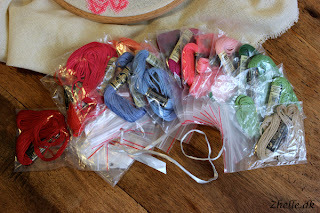 All the threads I use for this project, I keep in little plastic bags tied together with a piece of ribbon. I find it easier to keep them from getting tangled this way, and at the same time I know where all my threads for the project are! I ordered both threads and linen from Craft Department. I have ordered from their website several times, and I have always been happy with the quality of the products and the speed of the delivery. I will definitely recommend them to anyone that needs craft supplies.